Until comparatively recently, I'd never met anyone else who'd seen, let alone owned the Advanced Dungeons & Dragons Monster Cards. Released in four sets of 20 cards in 1982, they were apparently not widely released, thereby explaining their relative uncommonness. 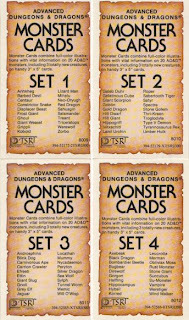 I owned all four sets, because I owned everything TSR released for D&D back then and because I genuinely believed I'd get a lot of use out of these cards -- except that I didn't. Each monster card is roughly the same size as a large index card. On the front side is a full-color illustration of the monster in question and on the reverse are abbreviated Monster Manual stats and some descriptive text. Each set included 17 standard AD&D monsters and three new ones. Several monsters made their debut in these cards, but I can recall only one -- the thri-kreen -- that stands out as having become a new classic, unless you count obliviax moss or the galeb duhr as "new classics." And of course the thri-kreen itself is, in one of those ironies that often afflicts overly litigious corporations, a knock-off of Arduin's phraints. The real interest of the cards, though, is the new art in a wide variety of styles, from the phantasmagorical Erol Otus to the comic book stylings of Jeff Dee. Some of the illustrations are better than others, of course -- I particularly dislike Jim Roslof's kobolds, for example -- but I have long felt that one of the great strengths of the Golden Age was its esthetic diversity, which stands in contrast to later ages, which seem to have trade that diversity for better overall art direction. I presume the intention behind the cards was that the referee could use them in play as a handy reference without having to consult the Monster Manual for stats. That's certainly how I'd assumed I'd use them. The problem is that, even in 1982, AD&D monsters were still simple enough mechanically that there was little to no need for such reference tools. Most monsters could have their stats written on a single line of two-column text and the rest required two at most. Likewise, monster abilities were simple enough that, so long as you'd used a monster before, you could pretty easily remember how they worked. It wasn't a matter of "rules mastery" or having a photographic memory so much as the fact that AD&D, at its root, was still a simple game. You really could keep it all in your head without the need for constant page flipping and chart scanning. This meant the monster cards were, ultimately, attractive but impractical curiosities. I suspect that TSR hoped more gamers would see them as essential than did so, which might explain why there were no more sets after the initial four releases. The new monsters were all eventually published elsewhere (in the Monster Manual II), but, with the exception of the thri-kreen, none has had a lasting influence over the subsequent development of D&D -- little wonder then that so few people remember these products. They then proceeded to sit in a drawer and eventually get thrown out, and to this day I can only remember four or five of the pictures. Man, definitely brings back memories. * Though I did, I admit, eventually get the puffy stickers with Strongheart et al and recognized the ones who showed up in the D&D cartoon. I must have ha a set of these; they sound so familiar. I'll be it's buried deep in my game collection. The goblin illo was my favorite. Oops...posted before I was finished. I did use the cards for a while as a visual aid; we were under the spell of the illo booklets from the S-series modules. It was a bit unwieldy, though, and all the cards got rubber-banded and placed in a storage box a long time ago. Heh. I have 3 of the 4 sets (all picked up at Waldenbooks) and have really only used them as visual aids. My kids find them interesting now, though. "I particularly dislike Jim Roslof's kobolds..."
I seem to recall Reints did a post on really loving the Kobold. Unless I'm thinking of something else--but I believe it's the one in his blog's masthead. Am I correct? the thri-kreen itself is, in one of those ironies that often afflicts overly litigious corporations, a knock-off of Arduin's phraints.Not only that, but the Monster Cards themselves were "borrowing" Hargrave's game accessory idea. Arduin's already published game cards included monsters as well as magic items. @Jay: Yes, on both counts. I can see how you think they'd be useful. I also agree with BPF above that the best use would be as visual aids ("You see a monster that looks... like THIS!"). My buddy BFM does great work with always having visual aids for creatures & NPCs. When I ran "Isle of the Ape" I did something similar -- took a box of dinosaur flash cards, taped AD&D stats to the back side. Sometimes I do wish I had this product. But you're right, I probably wouldn't use it and it would be one more piece of clutter on the table. There are four sets of Labyrinth Lord monster cards available. Does anybody use these? I've still got all 4 sets. Think they might be in a cubby hole on my desk from the last time a was looking through them. I got the four seats on e-bay recently. I guess Monster Cards were pre-historic minis. Don't agree with most illustrations, don't have much use for them. On the other hand, I have a bunch of visually oriented players, what I do is, use my photo printer to print out relevant illustrations of creaturtes, places and NPCs from the world wide web, from scanned in books and from my photo collection. It works wonders, especially portraits of NPCs that players encounter in the course of role-play. Yeah, just like you, I owned all four, thinking I'd use them, which I did maybe once. A neat idea, but not thought through very well. I've got to say, Erol Otus's ghoul is one of the most richly weird pieces of artwork to come out of early TSR (only topped, maybe, by his work on myconids for the Slave Lords modules). Also, the succubus was hawt. I collected all of the cards, and never used them, except in a sort of improvised "war" game with my little sister (I think we compared hit dice). Beyond the points you make, the cards were impractible for gaming purposes primarily due to the odd selection of monsters. It was unlikely you'd ever use more than two or three of the cards in a single adventure, due to both thematic and hit dice concerns, so if you needed quick aids for the monsters in your campaign, you were going to have to have a system outside of the cards anyways. That being said, they're a real indispensable treasure to me-- they have more personality as artifacts than a lot of the more-useful supplements. The golden age of gaming was, as you say, pretty visually captivating, and it was great to get such a good dose for what I think was still a pretty reasonable cost. More seriously, yes, I remember writing that comment now that you remind me of it. I think, as I've refined my feelings about old school art and esthetics generally, I've come to like Roslof's art less than I once did. I don't think it's irredeemable, mind you, but there's something about that no longer sits well with me. There's a certain cartoonishness to it, as there is with Dee and Willingham, that doesn't always work for me. I think I still have my copies of those cards. I *know* I have the Arduin cards as I recently found them in my office. The 'generic' Herculoids monsters included in the Arduin set are great, as are the Barsoom monsters. I use the 2nd edition set for quick NPC generation and quick lookup of stats for wandering monsters where the encounter has a lot of diferent types of monsters in it (e.g. orcs + goblin slaves + wolves + ogre mage). I suspect such a product might sell better these days, given the more complex stat blocks for 3rd and 4th edition. I remember those! I had one or two sets. Never actually used them, but they were kinda neat. The one important piece to my mind is the only illustration I know of the wind walker (by Otus).